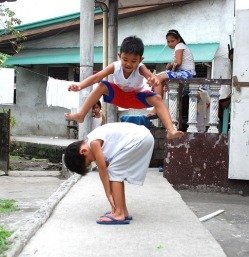 In the Philippines, the options are limited due to income, so they make their own games up. Some are games that have been around for years. 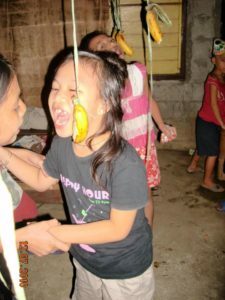 Our children were having a birthday party and had this game where they were trying to bite into bananas. Other games involve throwing flip flops or as they are called there, slippers. Sometimes they will roll old tires like children used to roll hoops in the USA. 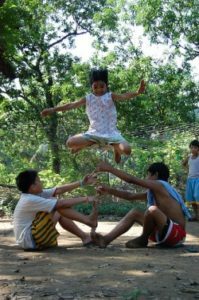 In some areas, the traditional games are starting to fade away due to basketball, baseball, and other similar games, but very often in the village, the traditional games return. If nothing else, children are very inventive and make up their own games. Our children saw a movie on TV about martial arts and suddenly, we had a group of budding Bruce Lees until that wore out. 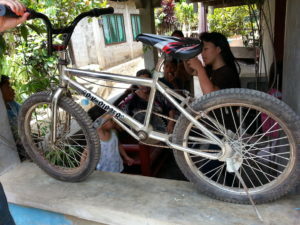 Since we do not have a vehicle for the children’s home, I purchased a bicycle and they share it sometimes when Inday does not need it. Here are some pictures of games. I have noted that some of the game pictures are not mine.